The paradox of modern fitness equipment is that it gives us a sense that we are healthy because we are working out and moving our body but in reality we may be creating injury and pain. How does modern fitness equipment and repetitive exercise make the human body unhealthy? That question can best be answered by how the human body deals with force. The definition of force is: a push or pull upon an object resulting from the object’s interaction with another object. Whenever there is an interaction between two objects, there is a force upon each of the objects. Now imagine a modern gym full of fitness equipment that is meant to exercise certain parts of the body such as a biceps machine, triceps machine or shoulder machine. These machines are designed to exert very focused force on certain areas of the human body in order to stimulate specific muscles or muscle groups. 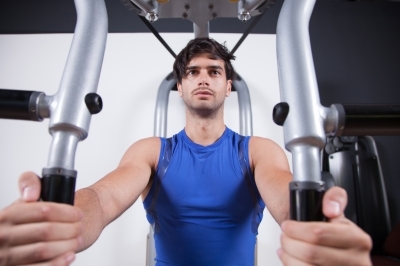 If modern fitness machines target certain muscles and muscle groups then it can be said that they limit the distribution of force to only certain muscles or muscle groups, correct? The idea behind machines and repetitive exercises is that when you limit the distribution of force to certain muscles or muscle groups those muscles or muscle groups get stronger in reaction to the concentrated force of the machine. The theory behind modern exercise is that when you work the muscles of the body in isolation your isolated muscle groups will magically assemble by themselves into a fully functioning and integrated human body. When you interact with any force in your daily life, your reaction to that force will be dictated by how you have trained your body to deal with force. When the human body is trained to deal with force via exercise machines that concentrate the distribution of force to just one muscle or muscle group the body will default to that training when it deals with force in everyday life. If you have inhibited the body’s ability to distribute force via your exercise choices, when your body encounters force it will be distributed amongst fewer muscles. This limited distribution of force, to only select muscles and muscle groups, results in a greater concentration of force on those limited muscles and muscle groups. For example if your body is reacting to 100 pounds of force with 5 muscles, if that force was evenly distributed, each muscle would bear 20 pounds of force. If your body reacted to the same 100 pounds of force with 10 muscles, if that force was evenly distributed, each muscle would only bear 10 pounds of force. This is how exercise machines and repetitive exercise create injury, pain and breakdown rather than a healthy human body by inhibiting the distribution of force in the human body rather than promoting the distribution of force.